These look really good, but I have a little nit pick that I would like to make. How about putting them in order (as they were in the original game) with the classic version being right next to it. Also, the casino level should be on the bottom in gold-ish film along with every other custom map that you have on your game. For those that don't have proper screenshots there should be a question mark. I know that it would require some scripting but I think it would be worth it. This is really cool - I'd love to see this implemented somehow in-game in a future release! what about Character selection like the poses of the characters in the original N64 version? I'm not at all surprised to hear that actually now thinking about it... I mean, it needs to be a very quick and simple process to get in game, I can see how mouse clicking through a scrolling character screen could become unnecessarily time consuming, and possibly tiresome. I could of course do it exactly like the N64, I could even get some good quality in game screenshots using an emulator. Or you could use this as a base. The green folder is there and has a visible shape. I second that, it was horrible. The new one works much more favorably. *pats back* we all fucked up at one point or another. No both of them were lol, I redeemed myself for past failures. The old scrolling character select gui was actually the first thing i coded in source. 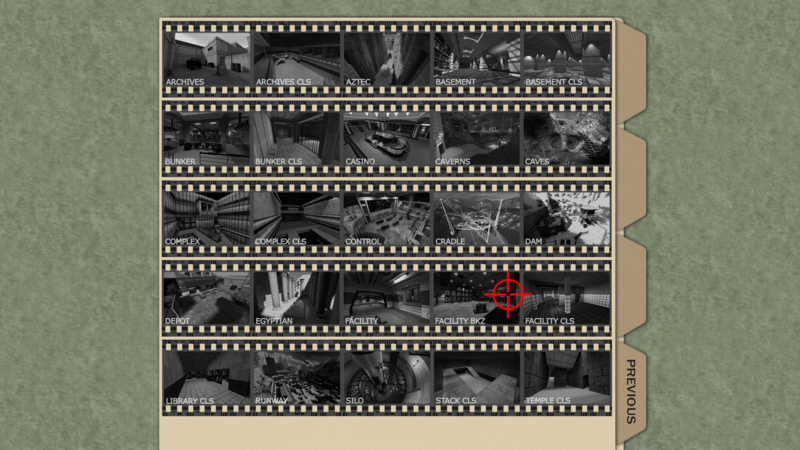 The result was intentional, this is the order of the Goldeneye Source Maps. Does anyone have a video or something to see how this version looked? Just curious. Try any beta 3 videos.